From the very beginning, St. Louis Park was more a collection of different neighborhoods other than a cohesive community. Each had its own commercial area (or at least a grocery story), went to the neighborhood elementary school, and basically didn’t interact very much. Each neighborhood also had (and was made possible by) a different means of transportation into Minneapolis. One of those neighborhoods was called the North Side, defined as the area north of the Great Northern Rwy. tracks (now the BNSF). The area was mostly undeveloped, and before World War II it remained fairly stable with a small population for 10-15 years. After the war, of course, the acres of undeveloped land were quickly filled with housing and all that went with it. But in the old days, the fields were mostly known for the number of gravel pits and summer grass fires. In 2017, John and Albert Yngve and Louis Larsen reminisced about growing up on the North Side. They said that the area was considered the “slums,” populated by some rough characters like the Gibsons and the Linskogs. Perhaps the most prominent family on the North Side was the Larsen Family. There was another neighborhood centered on Colorado and Wayzata. It had no name, but was mostly owned by John A. Johnson, who platted a subdivision in 1918. In 1912, Johnson’s daughter Esther noted in her journal: “Oh Well we all know Northside is a progressive place when it once gets started.” Read more about the Johnsons in the story of the Yngve Family. Besides the Johnsons, a prominent family was the Blanchettes. James J. and Winefred (Winnie) Blanchette lived at 6221 W. 14th Ave. So. This address now falls into the large tract at 6009 Wayzata Blvd. From at least 1933 to at least 1958, William was listed in the directory as an “usher” at the Great Northern Railway Depot, which is now the site of the Federal Reserve Bank. An usher was kind of like a Red Cap. James and Winnie had no children. James’ brother William P. Blanchette and his wife Evelyn lived at 1701/1401 (the number changed, not the house) Colorado Ave. Today there is a building at 1405 Colorado; though a commercial building, it was built in 1929. The brothers’ houses were probably next to each other. William was also an usher at the Great Northern Depot. William and Evelyn had a daughter Jeanne who worked for awhile as an elevator operator at Dayton’s Department Store. Many residents were perched along Wayzata Blvd., which was a three-lane road with a “suicide lane” in the middle, where cars would play “chicken” to see who would turn first. If you didn’t have a car (or your Model A didn’t run in the winter), mass transit had to be used. 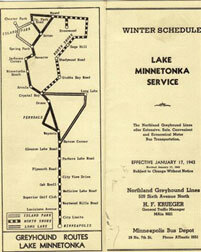 One method of getting to downtown Minneapolis was the Dan Patch/Minneapolis Northfield and Southern Railroad. One train ran each day, to and from downtown. The preferred mode of transportation was by Greyhound Bus, which had two regular routes to Mound and Long Lake, starting in about the 1920s. The bus stopped at Colorado, Zarthan, Natchez, or wherever a passenger was waiting. No doubt the Twin City Lines buses made regular runs by the 1950s. As far as getting to other parts of St. Louis Park, before Highway 100 was built in 1939, there were only two ways, according to Al Yngve. One was a “wooden humpback” bridge at Louisiana Ave. over the Great Northern tracks. The other was the underpass at Virginia Ave., which remains the same today as it did in the 1930s, still an important north-south route. See Highway12 for the history of the road and prominent buildings. Before the war, the area was mostly made up of farms and businesses were scarce. The Yngve Brothers and Louis Larsen remembered that they mostly shopped in Hopkins, grinding grain at a mill owned by General Mills. They also bought feed and malt for their chickens. An incomplete review of 1933-on directories shows that in 1934 there was Rey’s Groceries and Gasoline at Louisiana and Wayzata Blvd. In 1939, Golden Valley had Bill’s Place, at about present-day Park Place. Very little else survives the prewar era, other than five (of six) prewar buildings on Wayzata Blvd. between Rhode Island and Texas. The buildings that dot Wayzata Blvd. now were built mostly in the 1950s and ’60s. One conspicuous business was the notorious U.S. Silver Fox Farm. A thorough look at the North Side would be incomplete without reading about the Fox Farm. After World War II, the North Side exploded with growth – see Postwar Building Boom and Jewish Migration to St. Louis Park. One result was the formation of the Northside Community Club in January 1954. According to a Dispatch article dated January 28, the club was formed for the purpose of “tieing into the community for the benefit of all residents.” Temporary chairman was Gordon Middag. The group made it clear that it was a thoroughly new group, not affiliated in any way with the Eliot PTA, the old Eliot Improvement group, nor the Westwood Hills Improvement Association.